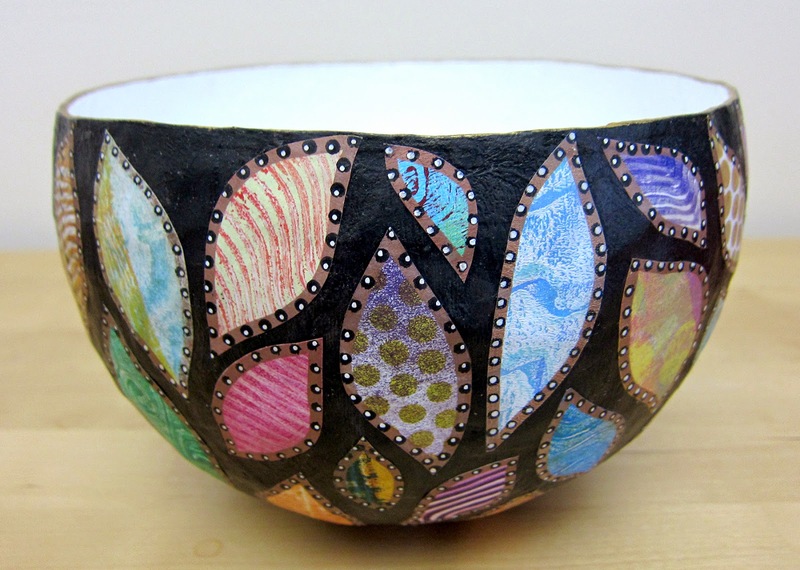 Printing with Gelli Arts®: Paper Mache Bowls with Gelli™ Prints! 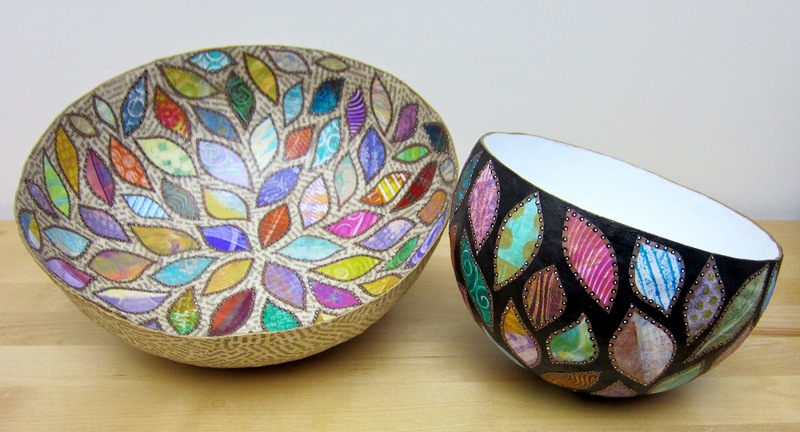 Paper Mache Bowls with Gelli™ Prints! If you're eyeing your pile of Gelli prints and scraps, wondering what you might do with all that luscious paper...think paper mache bowls! 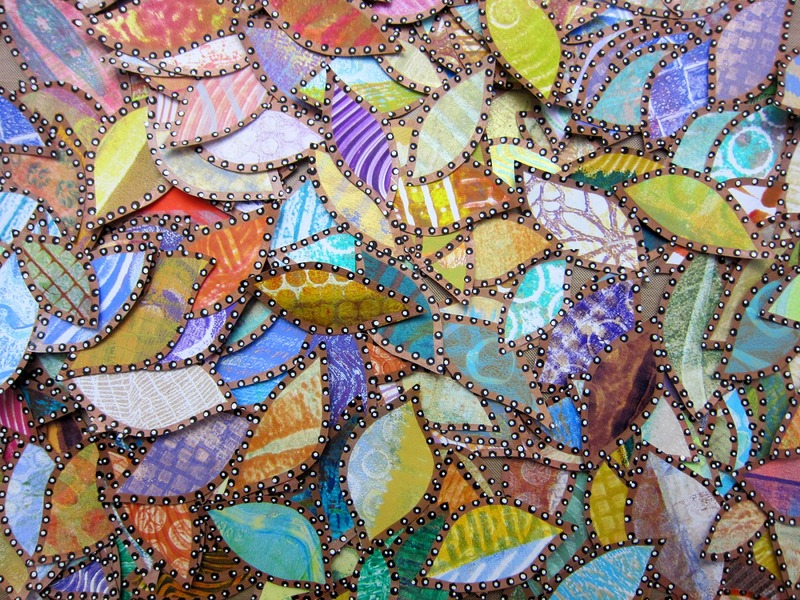 What a great way to create something fun and functional using papers from your Gelli stash! 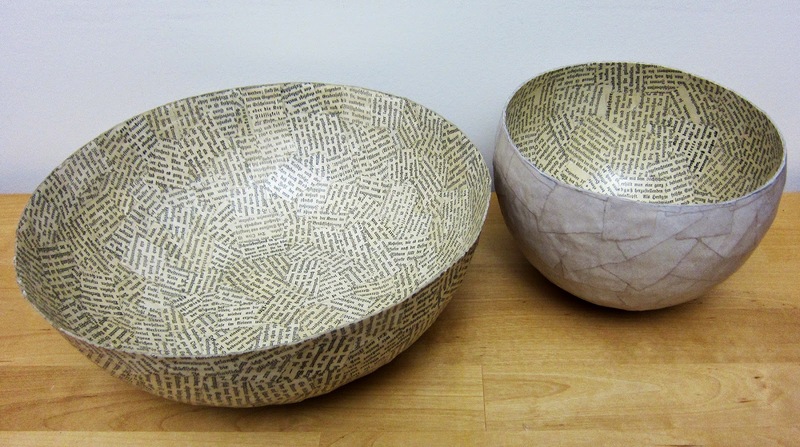 Paper mache bowls have been around for ages. They range from children's school projects to fine art objects, and everything in between. Perfect inspiration for ALL of us! pieces or strips, or punch shapes—depending on the look you're going for. 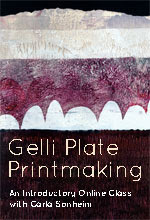 You'll need plenty of small pieces of Gelli prints! Thin paper, like copy paper works great! 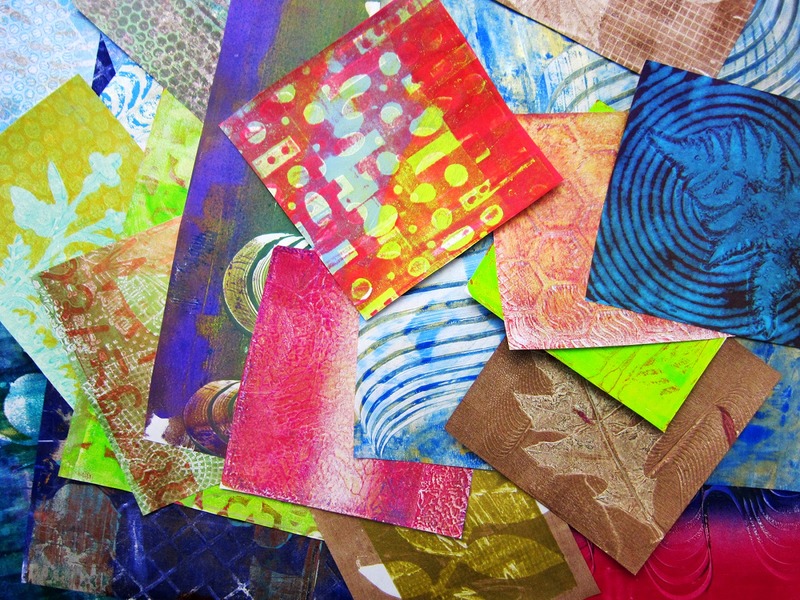 All of the Gelli printed snippets used here are from prints made on plain copy paper. 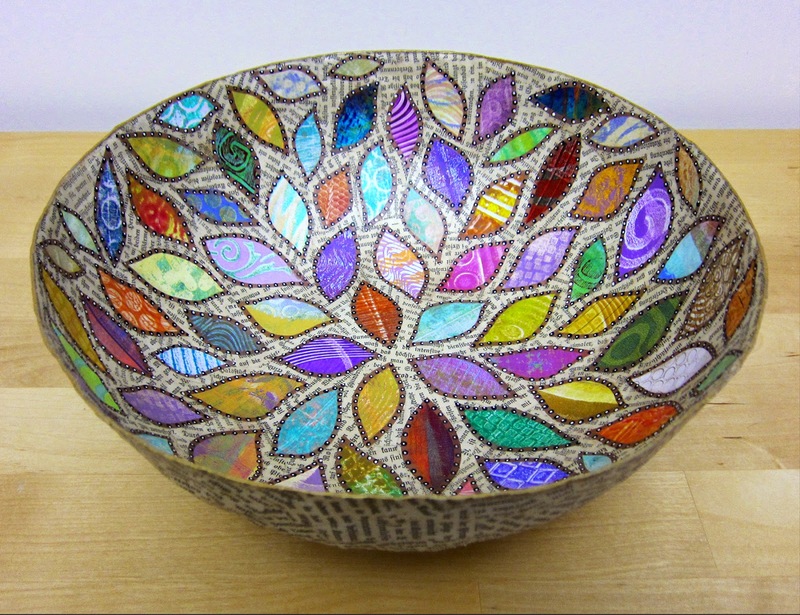 To make a durable bowl, you'll also need to prepare torn pieces of 'filler' paper for building up layers. 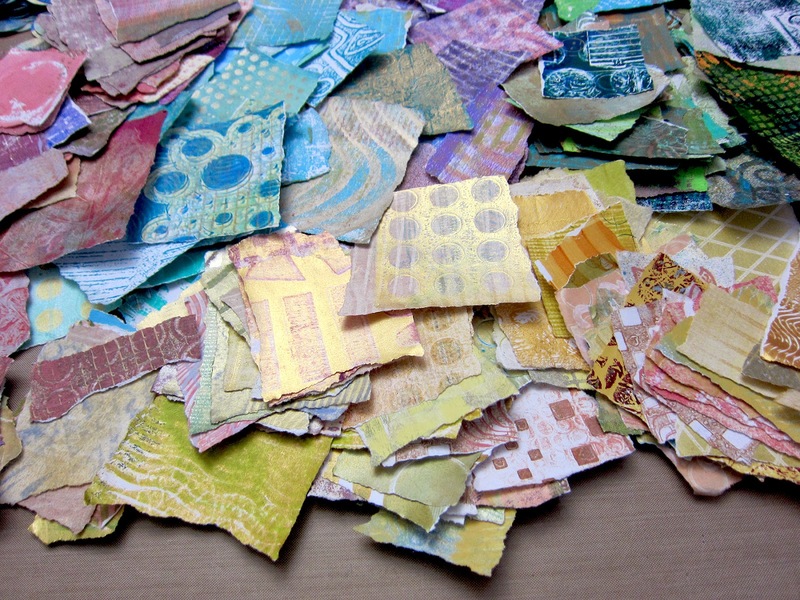 Newspaper is commonly used for making paper mache. I have loads of old book pages that are perfect for this purpose, so that's what I used—along with unprinted newsprint paper. 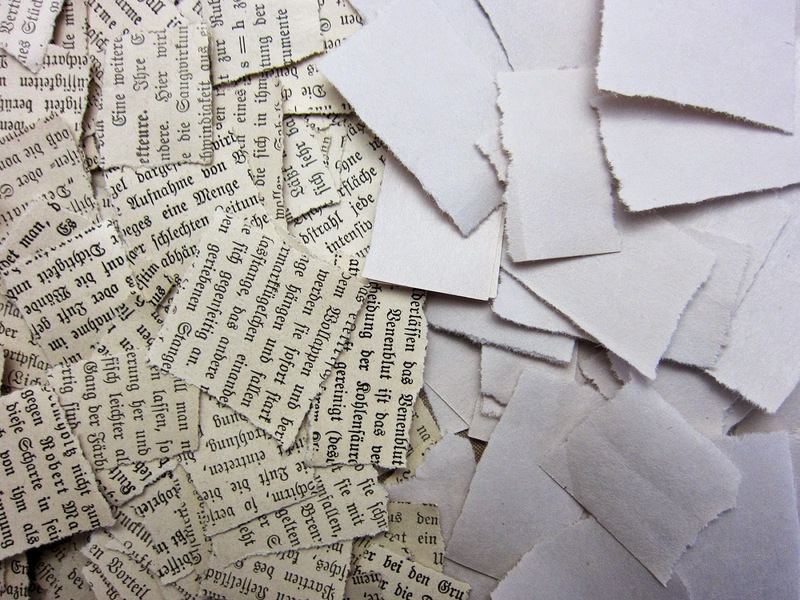 TIP: Tear your paper into small pieces for a smoother bowl surface. Larger paper pieces can form lumpy folds and creases as it's applied to the curved surface. To keep things simple, I chose Mod Podge for the adhesive—thinned down with a little water. 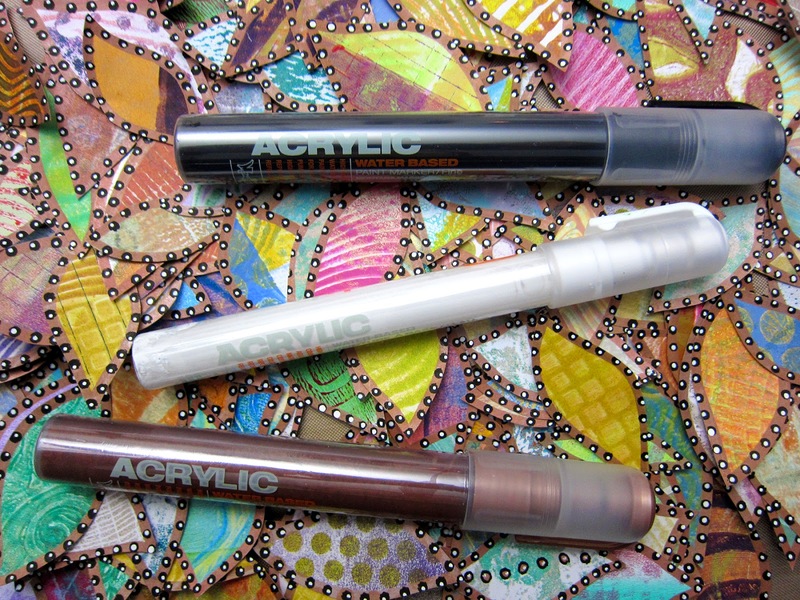 There are many suitable adhesives and mediums you can use, such as matte medium or diluted white glue. Paste recipes are easy to find on the internet if you're inclined to make your own. 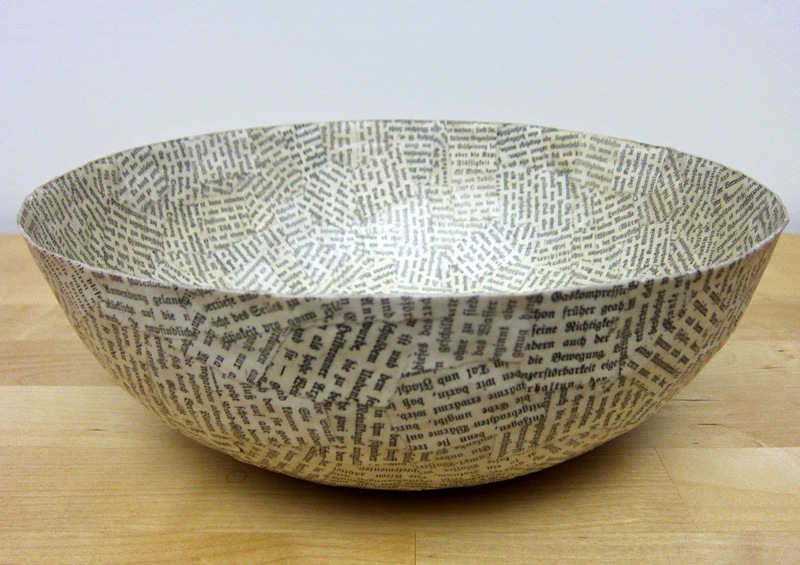 To begin, you need a form for the structure of your paper mache bowl. You can select a bowl with a shape you like, then tightly encase it in plastic wrap—but be warned: it can be a real challenge to remove the dried paper mache bowl intact. I find using a flexible plastic bowl much easier to work with than a rigid one. But my hands-down favorite form is a balloon. So that's the process described here. Blow up a balloon and tie a knot. Place the balloon in a cup to stabilize it. It helps to secure the balloon to the cup with tape. Pour some Mod Podge into a dish and stir in a little water, thinning it to the consistency of heavy cream. A foam brush is good for applying the adhesive, but I prefer to wear disposable gloves and use my hands. Apply adhesive to a small piece of torn paper and smooth it onto the surface of the balloon, removing any air bubbles under the paper. Begin at the top of the balloon. Continue applying adhesive to each paper piece and placing onto the balloon, slightly overlapping the previous piece of paper. 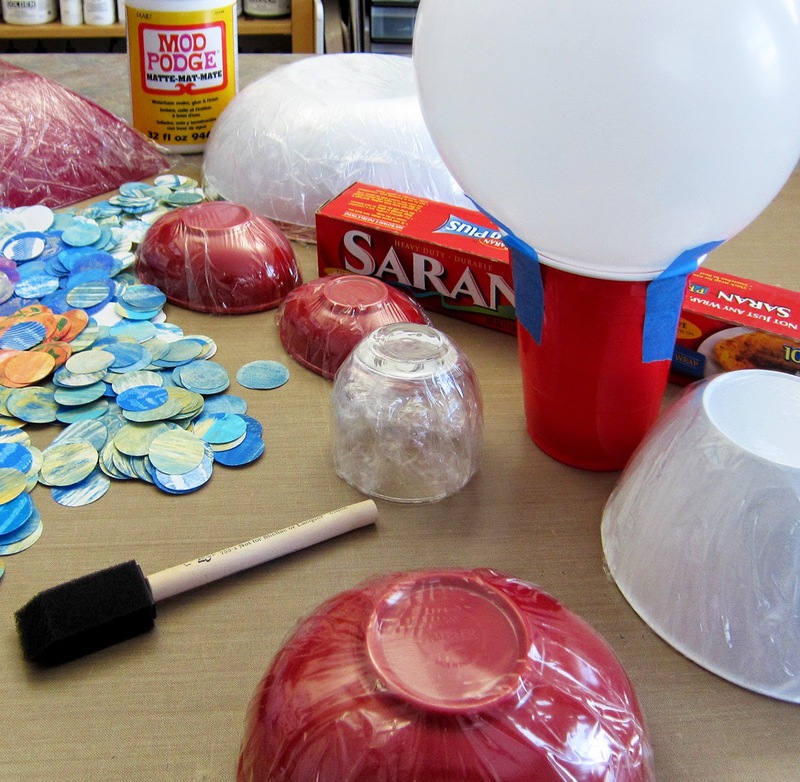 Do this until you create a solid layer that entirely covers the area of the balloon, forming the shape of your bowl. Allow the first layer to dry. Then add another layer. Build up layers, letting each one dry before adding the next. Each layer adds strength, and 5-6 layers should give you a bowl with a nice sturdy feel. Then let it dry overnight. To remove the completely dry bowl, simply pop the balloon! Take the deflated balloon out, revealing a smooth surface on the inside of your bowl. Trim along the edge with scissors to create an even rim. Or, if you prefer, leave the edge as-is for a more organic look. If you wish to paint the bowl, it's ready now! them to the bowl. Decorate the surfaces of the bowl, as you like. Let it dry, then varnish with a few more layers of Mod Podge or your favorite medium. 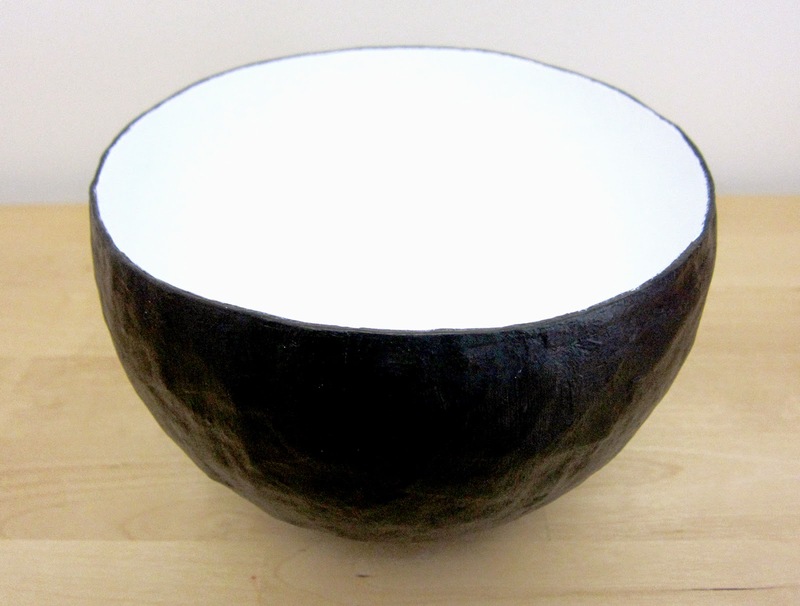 Pictured below is a bowl created on a large, fairly rigid plastic bowl. It was a little tricky to remove it when the paper mache was dry. Prying it off carefully and gently with a plastic palette knife worked best. 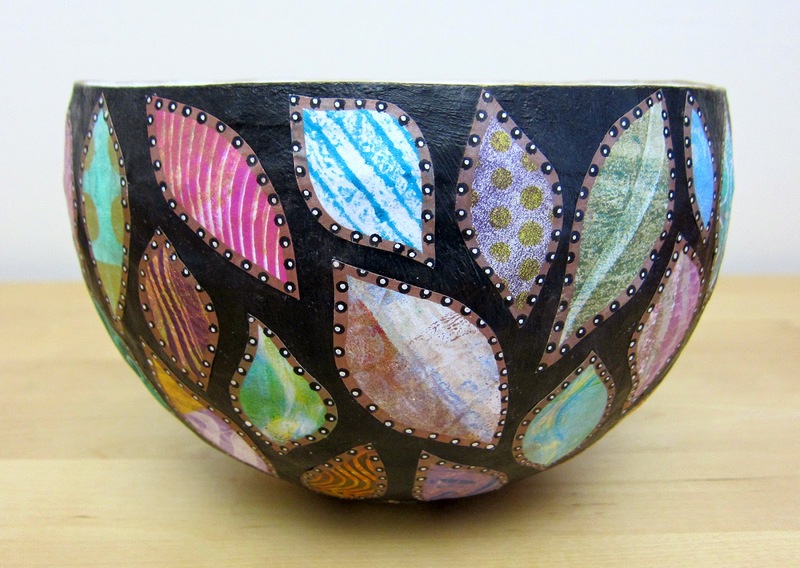 To decorate bowls like these, draw leaf shapes on many pieces of Gelli printed paper using a copper Montana Acrylic Paint marker (Fine—2mm). With a black Montana marker (Fine—2mm), add dots around each shape. Each black dot is layered with a small white dot from a Montana marker (Extra-Fine—0.7mm). Then cut out each small leaf shape with scissors. It's a slow, detailed process—quite like a meditation! A few considerations: Keep in mind, the underside of the first layer will show as the 'inside' of the bowl. If you want the smooth interior of the bowl to be made up of pieces of Gelli prints, use those for the first layer of printed papers, placed face down on the balloon. To make the different layers obvious while applying the small pieces of paper, I alternate layers of book pages and unprinted newsprint paper. This is by no means necessary, but it helps me see exactly where I am while creating each layer. It's easy to see if a spot was missed! Golden Hard Molding Paste, basically as a skim coat. I apply it with gloved hands and smooth it into a thin, even coat. 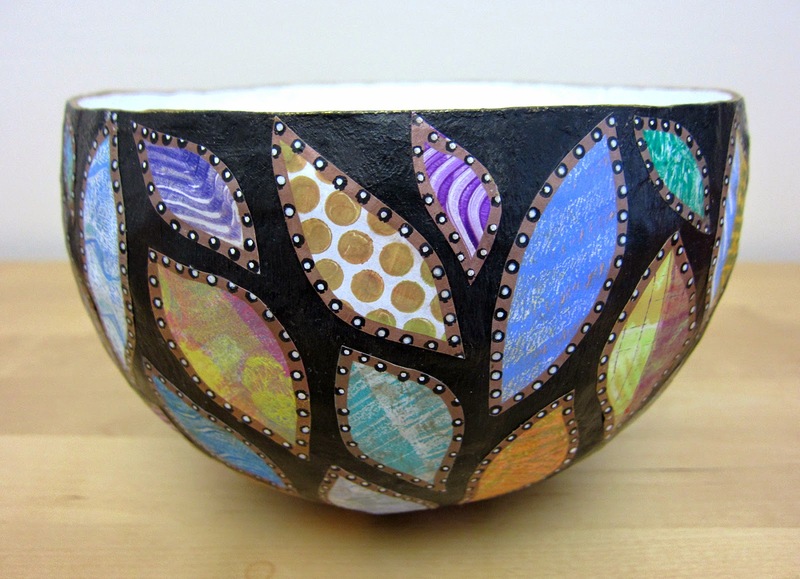 Once your paper mache bowl is decorated and dry, you may want to continue working on the surfaces. 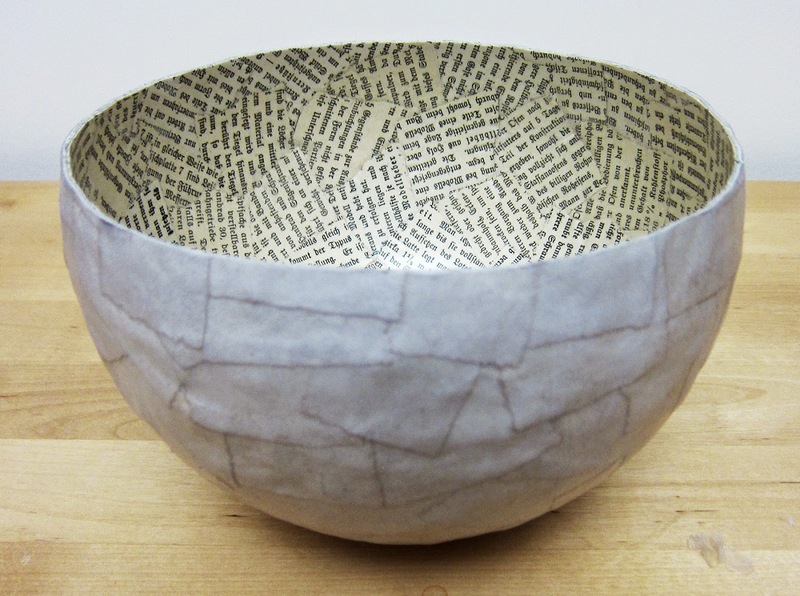 Add more collage elements, paint, stenciling, doodles or journaling to your bowls! The creative possibilities are endless! So much fun! Try it!!! 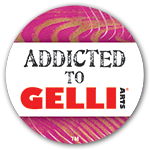 And share your photos with us on the Gelli Arts Facebook page showing what you've made! 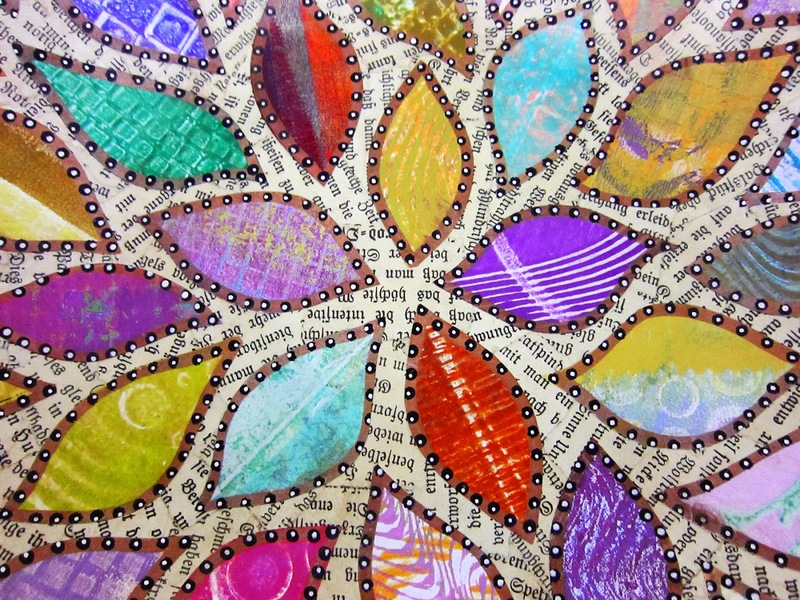 We love featuring creative works by our Gelli Arts fans!!! We also love reading your thoughts and feedback, so please leave a comment! Thanks! Happy New Year from all of us at Gelli Arts! What a grand idea! Love it. OH, OOOH! This is such a fantastic idea. I absolutely luv it. I'm gonna decorate the whole house with this idea!!! Such a fantastic idea! Blank papier mache forms cbe bought in many shapes too. Wow!!! You have inspired me to get out in the studio and have some fun. I love this project, you are amazing and so talented :) I would like to invite you to visit my blog and help me celebrate my three year blogging birthday with a Give-A-Way. 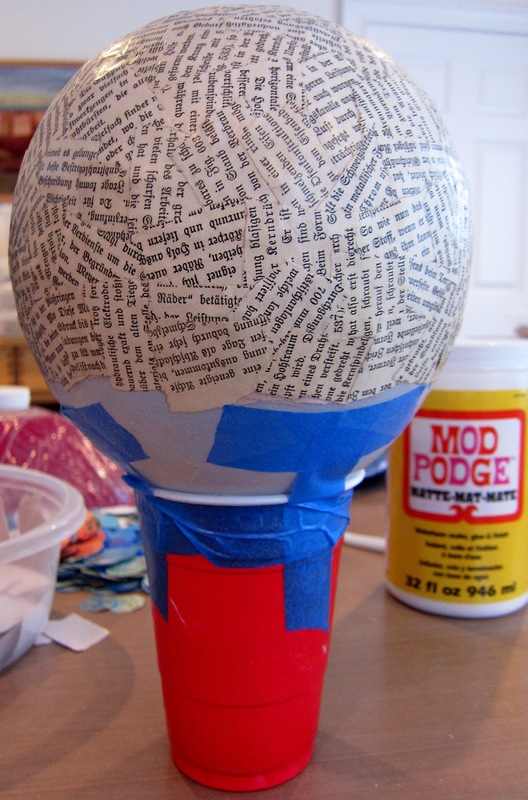 I knew this process of paper mache, what a great idea to do this with pieces from Gelly prints results! These are so beautiful! Very inspiring! This is an awesome gift idea! I think I will be trying this! I am in love with this idea!! Such an awesome way to use up scraps. They would make great gifts filled with fruit or other goodies to enjoy. I am going to dig around and see if I can find some balloons so I can get started this week! Thanks for the great inspiration! Great tip to use different papers for each layer to help determine where you are. Thanks! A FABULOUS project. They'd make great gifts! how cool!! I love the bowl!! beautiful!! Love the bowls. Thanks for sharing. What a great project for bits and pieces. Thanks for reminding me of this technique. I'm definitely going to do this again. 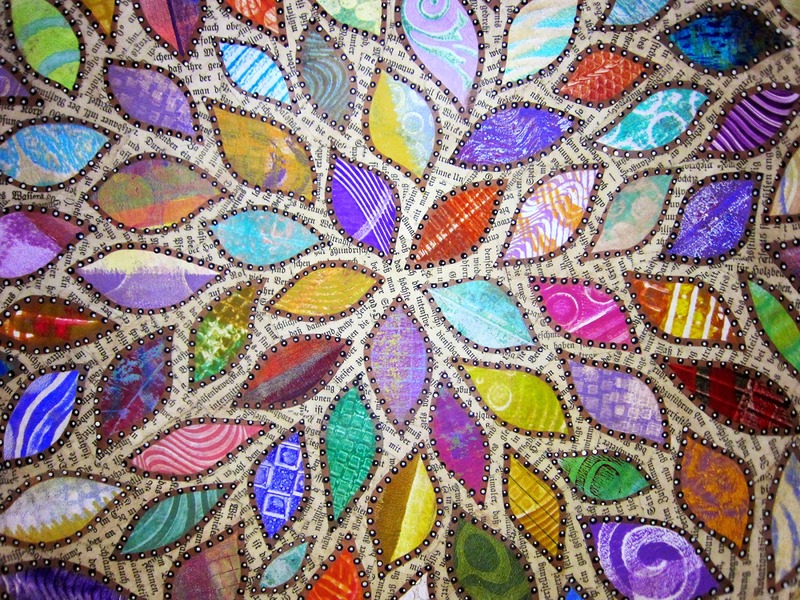 It just never ceases to amaze me that you keep coming up with more ways to use the Gelli plate or the output from it. Thank you so much for continuing that journey for us all. The plate has become one of the more versatile items to play with! Wow. Just gorgeous. And your tips are so valuable (I am a Mom who made two pinatas a year for children's birthday parties, so I can "relate"). Just fabulous! So gonna try this! This is a really good tutorial and the end result is stunning. aw this is a cool one I thought they were real bowls until I seen all the pictures too cool. Wow! These are so beautiful and perfect timing. I was just trying to decide between beginning paper mache bowls today with my small class of students or getting them started (hooked!) 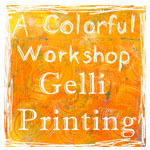 on making gelli prints. Now we can combine the two in one gorgeous finished project. Thank you for your easily followed directions and all the information about products that you used. Much appreciated! i want to try this and am wondering about the round bottom created by the balloon...how to use as bowl if not stable, or how to make stable? Love your bowls and your methods are so easy. Thanks for sharing. Have you tried putting the first layer on with just water, then sponge on the glue as the second layer - this helps with the struggle to get the project out of the mold. I love your post! You made it look so easy and doable! Thank you! I tried the cup method, and as an adult that was fine but for my 9 year old daughter it kept falling over so I made a change. I taped the balloon with plain clear tape to a low wide disposable paper bowl. It doesn't fall down this way. Just wanted to share. Thanks again! This is amazing! Love the patterned leaves on the bowls. My 10-year-old can hardly wait to do this. Do you think it would work to put the leaves onto the inside of the bowl after you have let it dry, or would it not be smooth enough? Thanks!